Cherrywell, Norman Rafferty, Rich Finn, Holden Crick, and Khatoblepas! Night House is written in the Quest system and requires installed Quest software (available for free at http://textadventures.co.uk/quest) to run. "what an amazing story!! i loved the atmosphere and mood. it was creepy and sad and nostalgic and fun all at once!! this is one that will stick with me for a long time." "A fantastic blend of creepiness and genuine emotion... At the beginning it was the atmosphere that I found outstanding, the author crafted a very eerie setting (I was sincerely scared to go outside). At the end, I have to admit I got a little teary. A very well done story." "I was surprised by how creepy I found it - definitely glad that I played it during daylight, and still had to look over my shoulder several times because the hairs on the back of my neck were standing up!" Excellently creepy and a lot of fun! 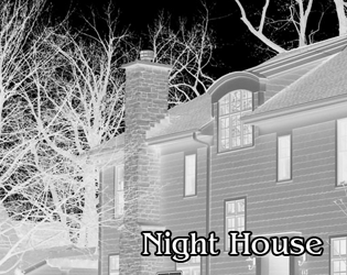 Night House was just the right length of play time, and just the right amount of difficulty, puzzle-wise. Thank you for making this game! That was really neatly done, very atmospheric. Nice stuff! Thanks very much! :) Glad you enjoyed it.